Suncast Storage Shed - Who Has The Best? A Suncast storage shed can be the ideal garden solution. Made of plastic resin they are tough and durable, and virtually maintenance free as well. On top of this, they often represent very good value for money when compared to similarly sized timber or metal garden sheds. 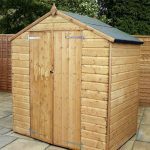 With a large range of sheds available from this manufacturer, the hardest part can be finding the model that’s just right for you and your garden. 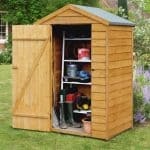 That’s why WhatShed have put together this guide to help you find an ideal Suncast storage shed. 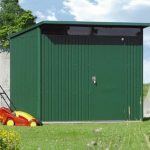 For the purposes of our league table we’ve looked at storage sheds that have a base area of eight foot by eight foot or below; these are ideal for storage purposes, rather than being design primarily as a workshop. We then looked at the value for money of each shed, and its design and aesthetic appeal. We are always impressed by the build quality of Suncast sheds, and often by their design features too, so choosing the ten best, and then the best one, was a difficult task. Well done then to the 7 x 4 Cascade shed, which thanks to its original and very attractive design, long 10 year warranty period, and competitive asking price earns the accolade of being named the best Suncast storage shed that can be bought online in the UK today. 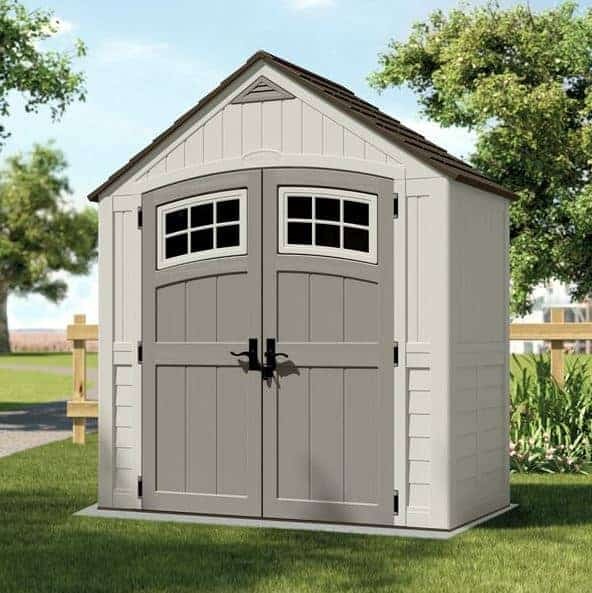 Whether you prefer plastic, metal or wooden sheds, WhatShed bring you the unbiased and in depth reviews that can help you make a perfect purchasing choice. The Suncast range of garden sheds are made exclusively from plastic resin, rather than having a timber or metal substrate, but if you think that makes them look dull or uninspiring then this could be the model to make you think again. This is the most attractive Suncast storage shed that we’ve reviewed, and for a mid sized garden shed it represents good value for money as well, particularly as it comes with a 10 year warranty which is as long as any offered with a Suncast shed of any size. This winning combination means that we don’t hesitate to declare this the number one Suncast storage shed available today. 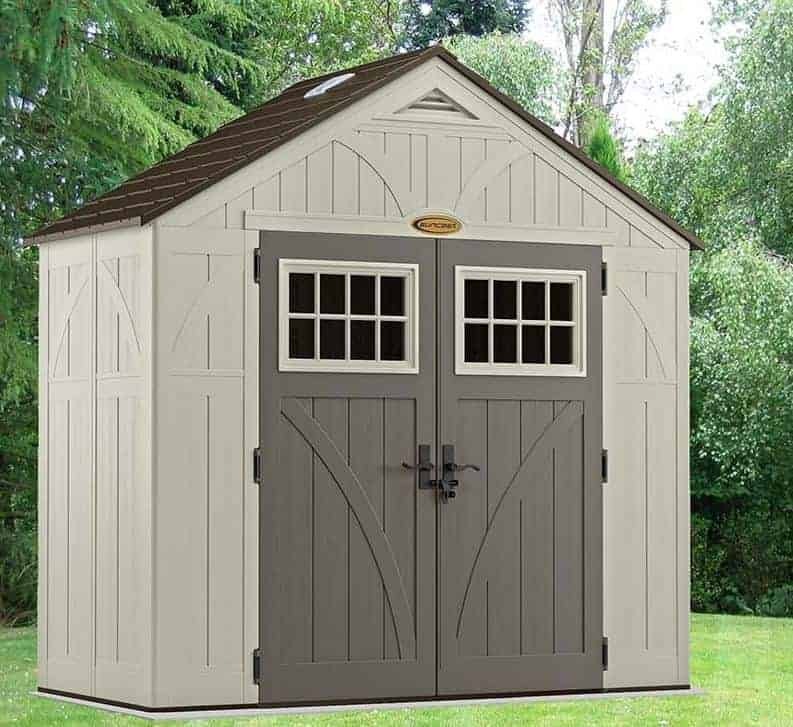 What really caught our eye about the appearance of this Suncast storage shed is that the double doors and the windows contained within them are both arched at the top. 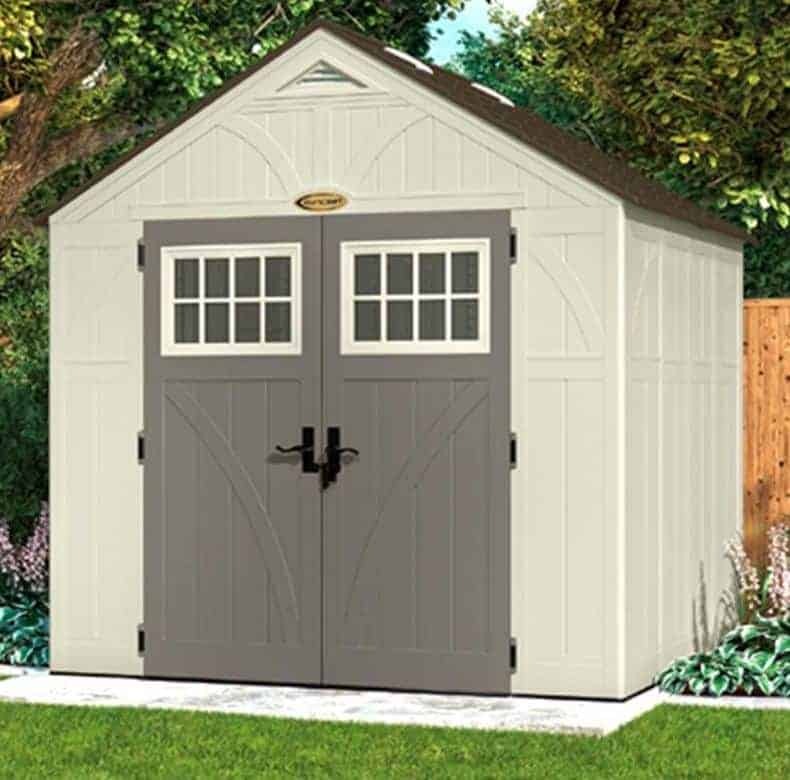 It’s a design feature that really stands out, and elevates this aesthetically above all other plastic sheds that we’ve reviewed. The roof too is highly attractive, having been given a shingle effect that we were pleased to find had been reinforced with metal for extra strength and reliability. 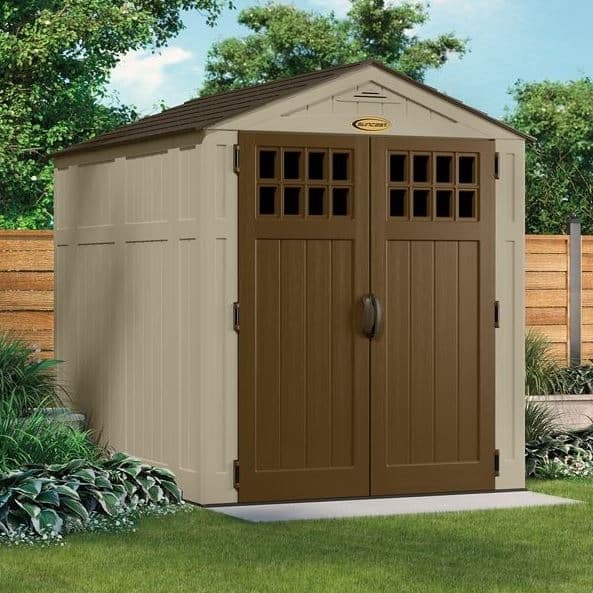 If you’re looking for a plastic shed that has an original look all of its very own, at a price that won’t stretch the budget too far, then this Cascade model comes highly recommended. 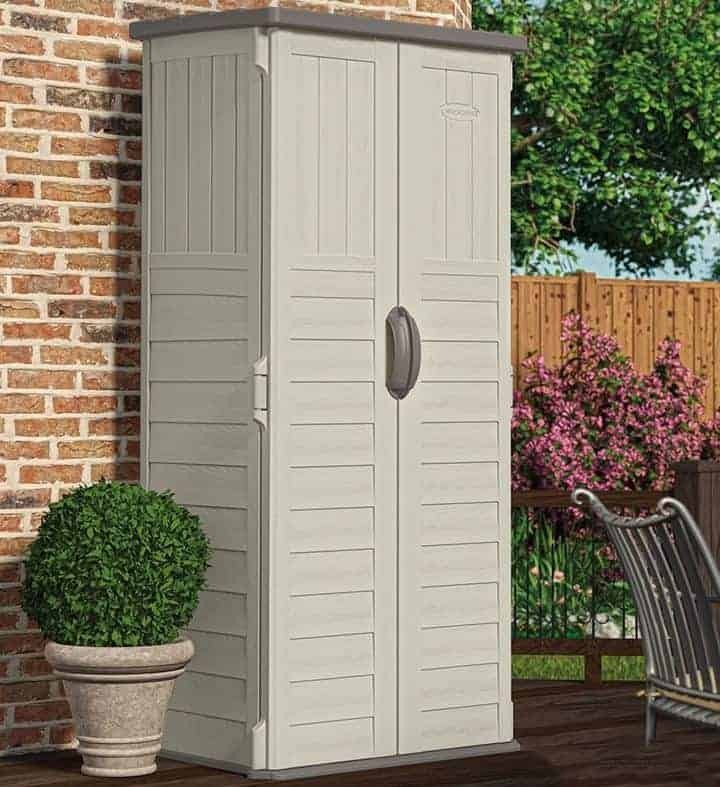 This is neither the largest nor the most excitingly styled Suncast storage shed to feature in our top ten league table, but it is the cheapest and by offering excellent value for money it gains the runner up position. Indeed, we feel that its compact footprint of just 0.82 x 0.65m can be one of its advantages, as it makes it an ideal storage solution for those people wh0 want a durable storage facility but have little or no lawn space available for a more conventional garden shed. Lightweight and easy to construct, this could easily be positioned on a patio, deck, or even on a balcony. 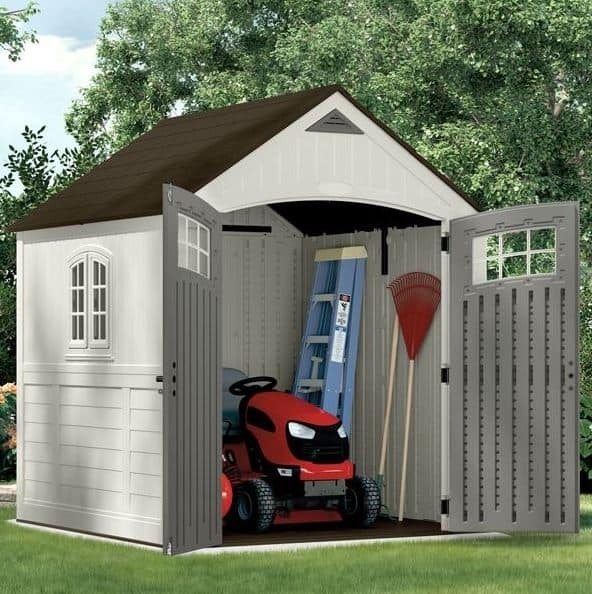 You can fit more than you might initially think in this Suncast storage shed, as its long and thin design gives it good vertical storage space. 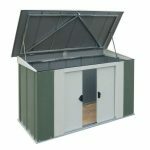 The peak height of 1.83m, or six feet, is as high as we often see on much larger sheds, and it even means that you can comfortably and easily access the shed whilst storing and retrieving items. What also impressed us was the inclusion of built in shelf supports, so although the shelves themselves aren’t included it’s very easy to attach them thus making this an even more convenient and well organised storage solution. The third spot in our Suncast storage shed league table also goes to one of the smaller sheds and one that offers great value for money. 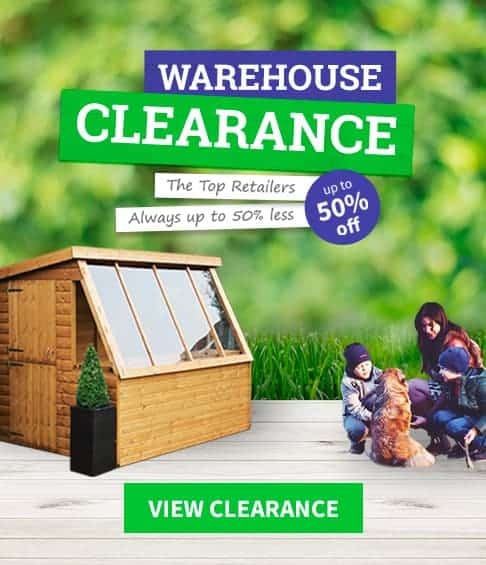 For a price of well under four hundred pounds, it’s now possible to have a five foot by three foot shed that is maintenance free, very durable, and resistant to rot, rust and fading. This model comes with a five year warranty, rather than the ten years that some sheds from this manufacturer carry, but we would expect it to last much longer than this warranty period implies without any problems occurring. One reason that we have such confidence in the durability of this Suncast storage shed is that it uses double walled blow moulded technology. This means that its cladding is noticeably thicker than we usually find on plastic garden sheds, and that of course means that it should feel very strong and stable too. There are no windows here, but we feel that can prove to be a useful security feature as it means that passers by will have no way of telling whether or not anything valuable is being kept inside. Whatever is stored within, getting it in and out is simplicity itself thanks to the wide opening double doors that occupy the full frontage of this compact building. Once again we have a Suncast storage shed that has a unique design that also proves to be very useful, and it’s for this reason that it achieves a position within the top half of our league table. This has a base area of approximately four foot by three foot, which whilst not the smallest in our list is compact enough that it won’t detract significantly from the space available in the garden itself. Where it differs however is in its vertical height, as it has a peak height of just 1.16m. This means of course that it’s not suitable to spend time inside, but for storage purposes alone it scores very highly. 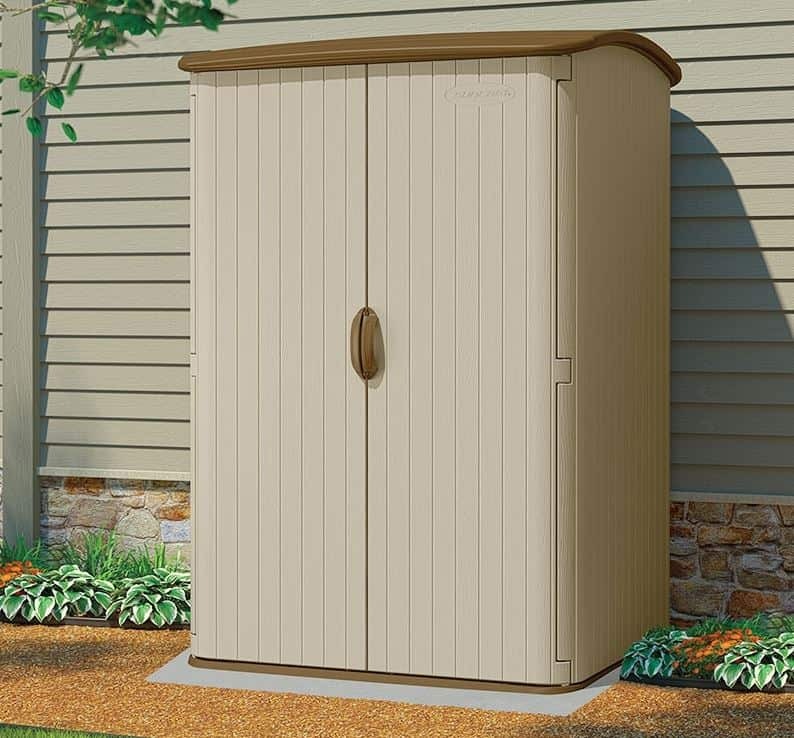 Having such a low profile means that this Suncast storage shed can easily be positioned behind a fence or a wall, which can make it a very secure storage facility. We also feel that this would be an ideal storage facility for a caravan or mobile home, and because the plastic cladding is fire resistant it should comply with the fire safety regulations that most caravan and camping parks have. We also liked the reinforced floor, which makes this a perfect and low cost place to store heavy and bulky, if not tall, items. This Suncast storage shed takes its inspiration from traditionally designed wooden apex shed, yet its strong resin cladding brings them into the modern age by making them tough and durable without the need for annual retreatments. 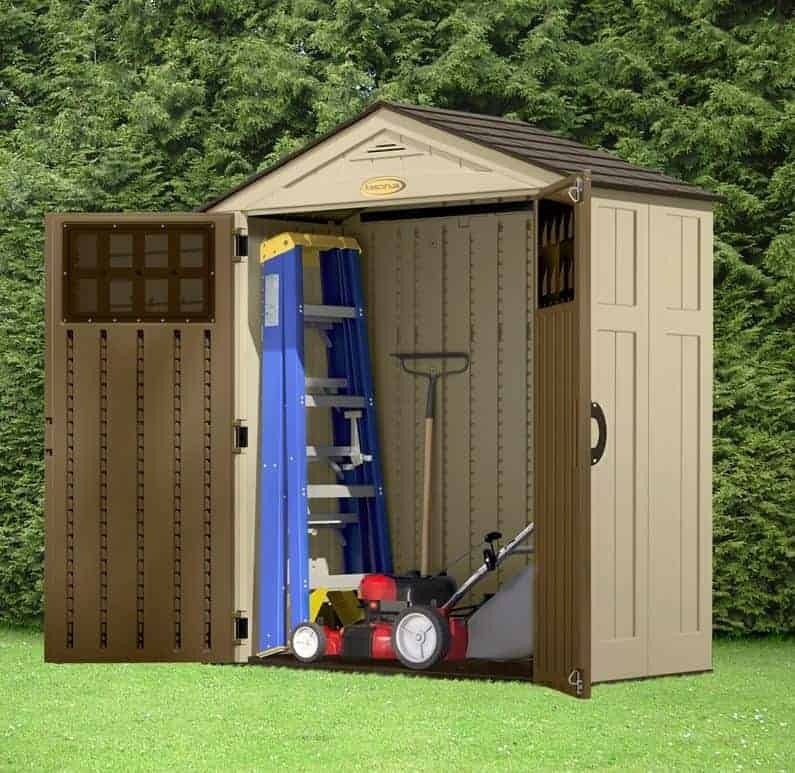 After the Cascade model which occupies the top position in our league table this is perhaps the most attractive of all the Suncast sheds we’ve reviewed, and its only the higher price tag for what is a small to mid sized garden shed that prevents it being placed much higher. The double doors at the front of this Suncast storage shed are in a stone colour, whilst the body of the shed is vanilla, and the apex roof is a dark slate colour. We found this use of three distinct yet complementary shades to be very pleasing on the eye. We also liked the two windows at the top of the doors, and the two skylights in the roof. It means that this shed should be much better illuminated than most plastic sheds we review, and that also means that it’ll likely provide a pleasant environment to pass time in or to work in. With a ventilation panel integrated in the gable, you won’t have to worry about gte interior growing too hot on a sunny day either. 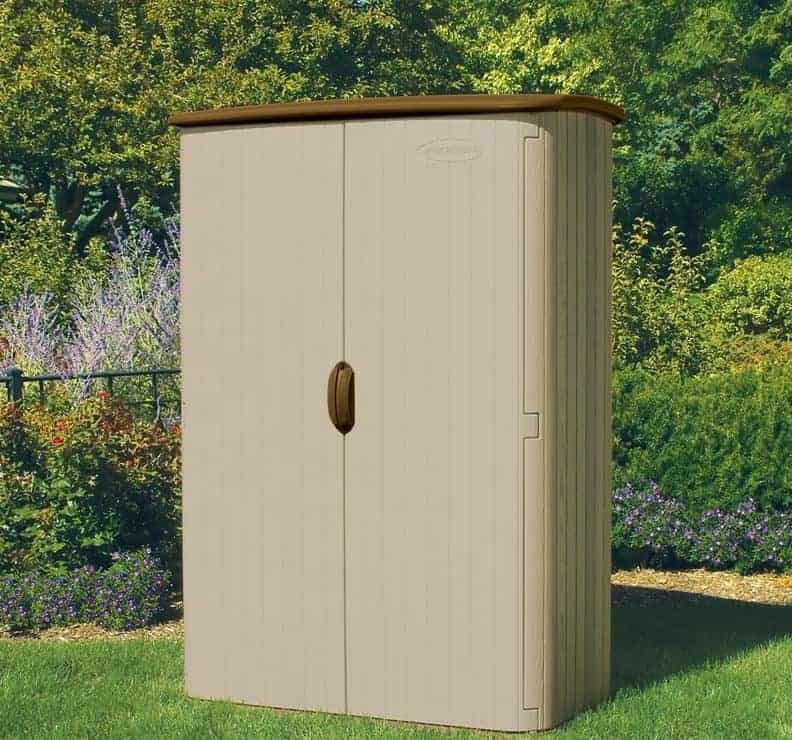 If you’ve only used wooden storage sheds and boxes in the past, you’ll be impressed at just how strong, durable and flexible this Suncast storage shed is, and it’s a money and time saver as well. It does this because once it is installed, which is in itself should be a quick and easy task thanks to the lightweight nature of the substrate, there’s no need to spend any further money on paint or wood preserver. The only maintenance needed may be an occasional hose down to remove algae, but even that’s less likely on this model thanks to the inclusion of a curved roof which ensures that rainwater slides away rather than being allowed to settle. We found that this roof also added to the attractiveness of the Suncast storage shed as a whole, particularly as its chocolate brown colour scheme contrasts nicely with the off white used for the main body. We also liked the way that a woodgrain effect had been added, although there is no denying that this is a plastic looking shed. We know that may put some people off purchasing it, and the asking price too is a little higher than we would have liked to see for a five foot by four foot shed with a peak height of 2.03m. These have been taken into account when determining its final position, but nevertheless we feel this is a good choice for people in search of a compact storage shed. 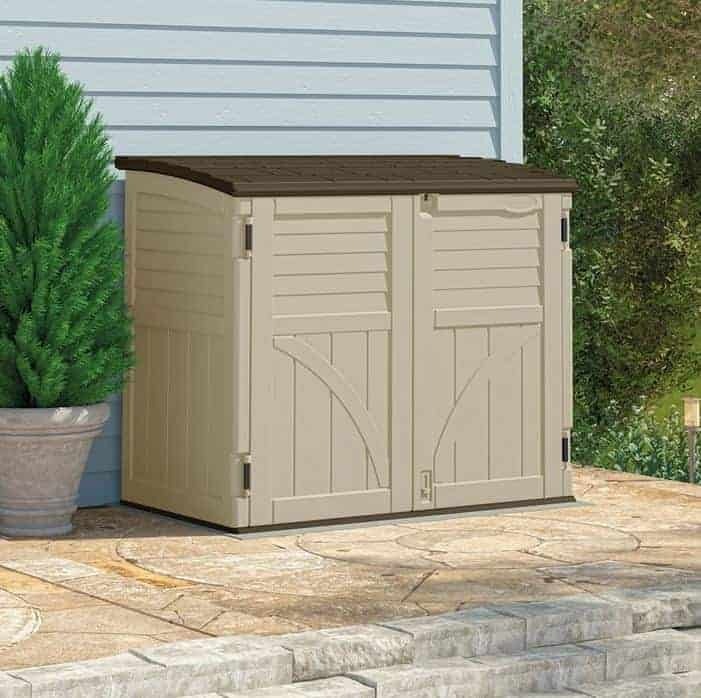 This is the second Cascade model to win a place in our Suncast storage shed league table, and once again it has a very attractive and original design that lifts it above most other plastic sheds that we see. It’s also a larger model, but it’s the significantly higher asking price that sees this achieve a lower ranking. With a base area of 2.13 x 2.13m there’s a lot of storage space available, and the wide double doors mean that maneuvering items of any size in and out is a simple task. That’s one of the reasons we can imagine this being used as an all weather store for ride on lawn mowers or even motorcyles, particularly due to the non-flammable nature of the shed. There’s a lot of light inside this Suncast storage shed as well, and that’s not something that we often see in mid sized plastic garden buildings. As well as the arched windows in the doors, as attractive as they are functional, there’s a further square window on a side panel. We were also pleased to see that there was plentiful ventilation built into the panelling, especially as plastic sheds such as this can often suffer from condensation in both cold and hot weather. 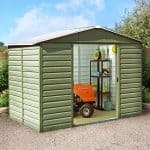 This is the largest Suncast storage shed to feature in our WhatShed league table; although the manufacturer does make larger garden buildings, they are designed more for use as a workshop rather than for low cost garden storage purposes. With its generous dimensions comes added versatility, as it means that it could easily be used as a garden retreat or as somewhere to pursue a hobby or event to work inside. One reason that this Suncast storage shed can be used for so many purposes, as well as its size, is that it has four skylights positioned across the apex roof, as well as two windows at the top of the double doors. This means that light should reach into every corner of the building, which will come in very useful whether it’s being used for storage or working purposes. As most of the light comes from skylights rather than windows mounted on the side of the shed, that also makes it much more difficult for prying eyes to see inside, which in turn can make it much less likely to be targeted by opportune thieves in search of easy pickings. To further enhance security, we were glad to note the inclusion of two metal handles on the doors that can easily have a padlock added to them. This is a very attractive compact Suncast storage shed, and it is only the higher than average price tag attached to it that stops it achieving a higher placing in our list of the ten best Suncast sheds that can be purchased online in the UK today. We really liked the beige and chocolate colour scheme, although we appreciate that it might not be to everyone’s taste, and the resin apex roof that has been designed in a tile effect that effortlessly carries rainwater away. The roof has a peak height of 2.24m and the eaves height of 1.81m means that you won’t feel hemmed in when you’re storing or retrieving your garden tools or equipment. Once again the double doors have windows across their upper section, and which have been given a decorative hatched effect. We were pleased to find that this Suncast storage shed has both a reinforced roof and a reinforced floor. With double walled blow moulded plastic being used for the walls, this may not be a large shed but it is very strong and durable. A 10 year manufacturer’s warranty shows how much confidence they have in this shed, as its twice as long as some warranties that they provide, and it’s a confidence that we share. Not all plastic sheds have to look bland or artificial, as the diversity within this Suncast storage shed league table has shown. This Adlington Three shed is another that really caught our eye upon first sight, with the dark doors and roof contrasting nicely with the beige coloured walls. It has a very accommodating interior, with base dimensions of 1.82 x 1.43m and a ridge height at the top of the apex roof of 2.23m. It’s not the largest shed in this league table, however, and yet it is the most expensive, and this discrepancy is what accounts for it being placed in the tenth and final position on our list. It does, however, have a lot of features that we really liked, the double doors being the ones that instantly grabbed our attention. Not only are they large enough to ensure that the storage of just about any item is an easy task, they also include the two rectangular windows that make the interior such a pleasant environment to spend time in. It’s a cool and welcoming environment too, thanks to the built in ventilation. This Suncast storage shed comes with a 10 year warranty, but it’s likely to prove far more durable than even this would suggest. 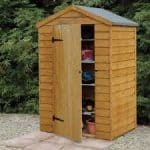 If a six foot by eight foot shed is the ideal size for your garden, then this deserves to be added to your shortlist.